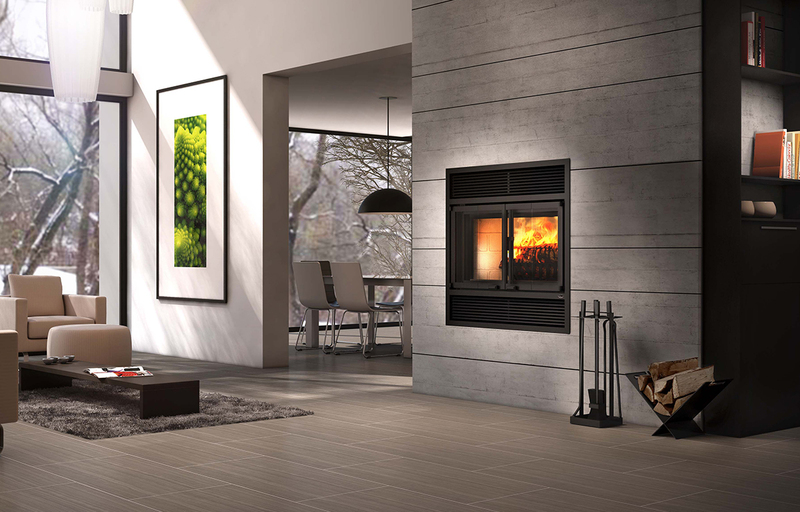 Imagine yourself sitting on your sofa or perhaps in your bathtub, sipping your favorite beverage and watching the fire as it dances, snaps and crackles through the modern style folding doors of your Beaumont fireplace. What a delightful way to relieve yourself of the day’s stress. Ahhh... now doesn’t that feel better? 100% of the last 16 homeowners who have registered their warranty are satisfied with this product. Glass surface – dimensions (Width X Height) 28 3/4" x 16 1/2"
Overall dimension (Width) 37 3/4"
Overall dimension (Depth) 25 1/4"
Door opening – dimension (Height) 14 1/2"
Door opening - dimension (Width) 28 1/4"
Firebox – dimension (Height) 16 1/4"
Firebox – dimension (Width) 18 3/4"
Firebox – dimension (Depth) 10"
Clearance – top (measured from the platform on which the appliance is installed)** 84"
Clearance – combustible side mantle to unit 0"
Clearance – combustible top mantle to unit N.A. Clearance – combustible side wall to unit 24"
Clearance – top shelf to unit 46"
The FP2 unit works very well. The ceramic doors allow me to reduce the heat radiation to the room, but even on the coldest days the house (1200 sq.ft.) becomes quite warm. The general design makes addition of wood quite safe. I prefer to split wood smaller than average to avoid smoking, but this unit gets hot enough that larger pieces are well consumed. One whole season before the necessity to remove ashes; that's efficient.